The acclaimed historian William Cronon once wrote that “the work we do is the predictable result of our own experiences and passions, but it is no less surely the unpredictable result of being at the right place at the right time.” This observation holds true for me. I grew up with the Jesse Owens Memorial Run. My parents still display a photograph of me crossing the finish line at the first two-mile “fun run,” a few months shy of my sixth birthday, and I have a lasting childhood memory of my first encounter with the Jesse Owens monument in Oakville, Alabama. I am grateful that Karen Cox, editor of Destination Dixie, believed that the commemoration of Jesse Owens in Lawrence County was a story worth sharing. 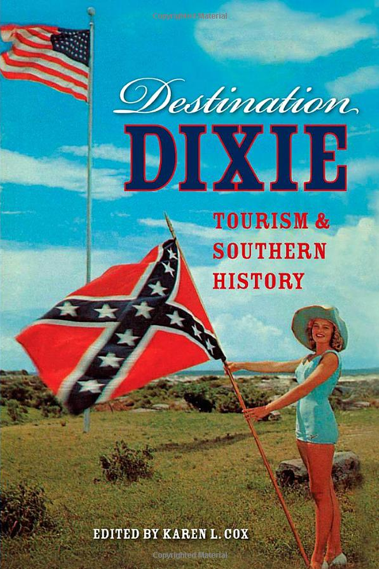 It appears as the second chapter within a collection of essays about southern history and tourism. The book offers a wide range of topics and includes chapters about cemeteries in New Orleans, slavery in Charleston, and Elvis Presley’s birthplace in Tupelo. Readers interested in Alabama history will also learn about the Confederate iron furnaces in Calhoun County and “selling the civil rights movement” in Selma, Alabama. Life doesn’t give you all the practice races you need. Jesse Owens married his high school sweetheart and had three daughters. Jesse Owens’ real name is James Cleveland Owens. After moving to Ohio as a young boy, he was asked by a teacher for his name to which he replied, “J.C.” Because of his thick southern accent his teacher mistakenly thought he said “Jesse.” Jesse was shy and never corrected the teacher, therefore forever being known as Jesse Owens. Jesse Owens had 10 other brothers and sisters. Jesse Owens was born in 1913 in Alabama. When he was eight, his family moved to Ohio. Owens went to Ohio State University, a segregated school, where he had to endure racial discrimination and prejudice. Jesse Owens proved to the world during the 1936 Olympics in Nazi Germany that any individual could achieve greatness, regardless of race, religion or national origin. Owens was a great speaker and traveled around the world giving speeches on religion, dedication and loyalty. Jesse Owens devoted much of his time to youth sports programs for underprivileged children. Jesse Owens led the way for other African American athletes.